Benedict Cumberbatch, "Sherlock" star and thief of many hearts, is engaged to be married -- that according to a traditional wedding announcement in a British newspaper. The 38-year-old British actor is marrying one Sophie Hunter, 36, an actress and theater director, according to the simple notice in the Times of London. 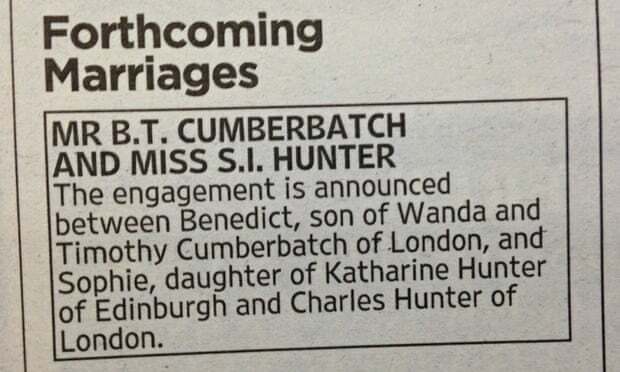 The pending wedding was also confirmed to People magazine by a Cumberbatch rep, who provided no further details. The couple, who were photographed together at the French Open in June, have kept their relationship low-key, according to the Guardian. Cumberbatch previously had a 12-year relationship with British actress Olivia Poulet, then dated artist Anna Jones. He told the Telegraph in September 2013 that while he keeps his private life private, he was not in a relationship at the time. "I'm not a commitment-phobe," he told the British paper. The actor, who in addition to his BBC television series has been in recent big flicks including "Star Trek: Into Darkness" and "The Hobbit: The Desolation of Smaug," will be heard as Shere Khan in 2016's "Jungle Book: Origins." Can't wait that long? "Penguins of Madagascar" is out late this month. Also: Here is Benedict taking off his shirt. Look, but don't touch. He's Sophie Hunter's now.